Toronto, Canada, July 15, 2008 - Overweight and obesity are a global pandemic, with 1.6 billion people-one out of four-packing on too many pounds. The World Health Organization predicts that this figure could rise to 2.3 billion by 2015. A solution is urgently needed. Edgar Cayce's Diet Plan for Optimal Health and Weight Loss by Toronto nutritionist Simone Gabbay is a revolutionary new book that gives you the tools you need to lose excess weight and achieve total wellness. Did you know that your body can burn fat even while at rest and that certain foods and food combinations enhance this natural process? "The nutrient-dense components of the Cayce diet synergistically support the body's fat-burning potential and help to balance the endocrine system, which plays a key role in weight management," says author Simone Gabbay. "Cayce's suggestion that the regular intake of grape juice, diluted 2:1 with water, achieves a metabolic reconditioning, provides an additional weight-loss tool." A chapter summary provides practical tips for implementing the steps outlined in each chapter and for getting started on the five principles of healthy eating distilled from the Cayce dietary recommendations. A selection of delicious, healthful recipes makes it easy to incorporate nutrient-dense, alkaline-forming foods into your diet. 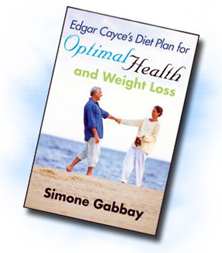 Simone Gabbay , RNCP, is a holistic nutritionist in Toronto, Canada, who has studied and worked with the Cayce material for more than 30 years. She is the author of two previous books on diet and health, both published by A.R.E. Press. She writes two regular magazine columns and is a frequent contributor to major Canadian health publications. Visit her website at http://www.simonegabbay.com .